After you listen to some albums, they leave you in awe, overwhelmed by the nature of greatness that has just laid claim to your auditory passages. 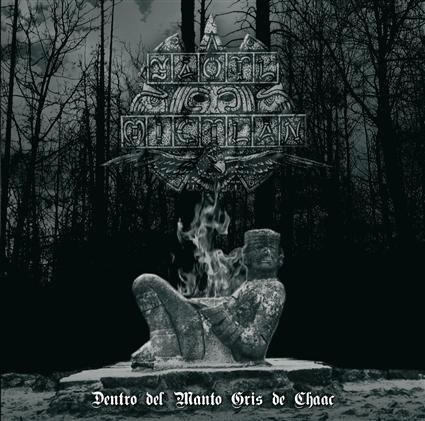 Yaotl Mictlan’s second full-length Dentro del Manto Gris de Chaac is one of those albums. Dentro ups the extremity and pure enveloping blackness that was harshly and beautifully displayed on their debut album, but with more direct and potent songwriting that demands attentiveness to its listening experience. The talent here was obviously noted because for the new record, Yaotl joined the roster of the long and strong-standing international label, Candlelight Records. Yaotl Mictlan uses its country of origin (Mexico) with themes and cultural aspects of the Mayan culture played out largely with a smaller, poignant use of Mexican instruments, particularly flutes, as well as vocals sung in Spanish. The production for Dentro is flawless, tremolo and straight riffing are grievously and densely sharp, the vocals are piercing and chilling, and the drumming, well it’s the best-produced and played I’ve heard in years. This might be the best black metal album you hear all year.